Policy matters, and these don’t work…unless the goal is to continually weaken the American economy. We need to wake up and realize that 93 million Americans out of work with fewer than 63% of available workers actually participating in the job markets is NOT A RECOVERY! Last month we were full of optimism and excitement because the report was mixed. Today…not mixed. We can’t even say we’re just 0 for June because all the good numbers from April and May were revised down. June of 2015 has proven to be a blood bath. Want evidence?…the report is so bad the markets can’t even get excited that a rate hike has just been pushed back yet again. Just for the record, Matt was about the only voice predicting there would be no rate hike in June when he was on CBS radio in Chicago for the May report. Usually we need to dive into the deep end of the data pool to find the true weakness in the report, but today all we have to do is wade into the kiddie section. 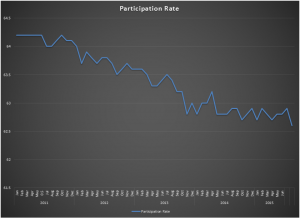 Why did the unemployment rate drop? Because the number of those in the labor force fell by double the number of new hires, silly! Yes, 223k net jobs added as the labor force shrank by – wait for it – 432k! The number of those describing themselves as “employed” was down 56k and those identifying as “not in the labor force” swelled by a staggering 640k. Now, all that is bad but can be summed up by the stat that takes center stage this month. 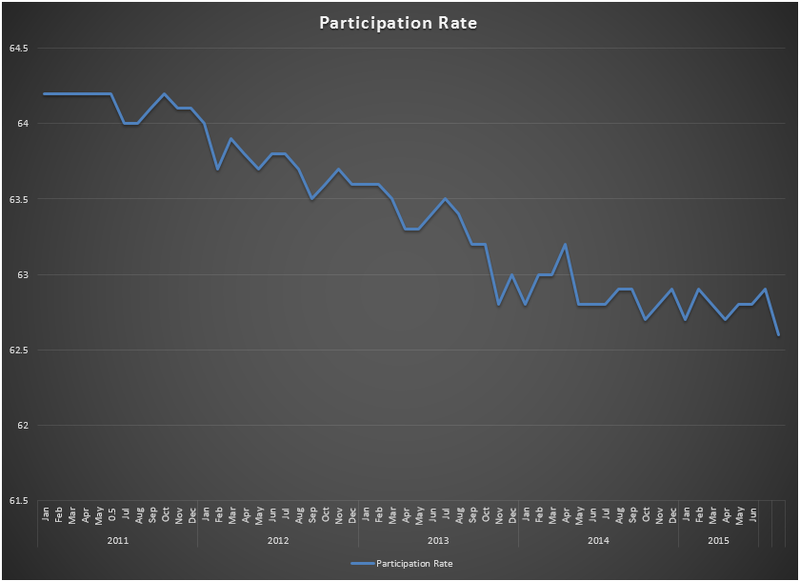 The participation rate had set and been hovering around an all-time “recovery” low of 62.8%. June of 2015 saw that floor breached setting a new low of 62.6%. The chart is included. There were 223k net new hires and that is the total private sector as government payrolls ended the month even. While below the consensus it is still over 200k which is generally respectable BUT…as we said above, downward revisions totaled negative 60k over the last two months, the work week was stagnant again, wages were flat and actually pulled back .3% to an even +2% for the year. Is there more weak data in the tables to report? Yes, but we’ve had enough for one day. Policy matters. These don’t work. This entry was posted in Analysis of Economic Reports, Blue World Blog Post and tagged business, capitalism, commerce, Economic Reports, Economy, Employment, entrepreneur, Experts, GDP, investment, Obama, Recession, recovery, stimulus, taxes, Unemployment, Wealth by blueworldadmin. Bookmark the permalink.